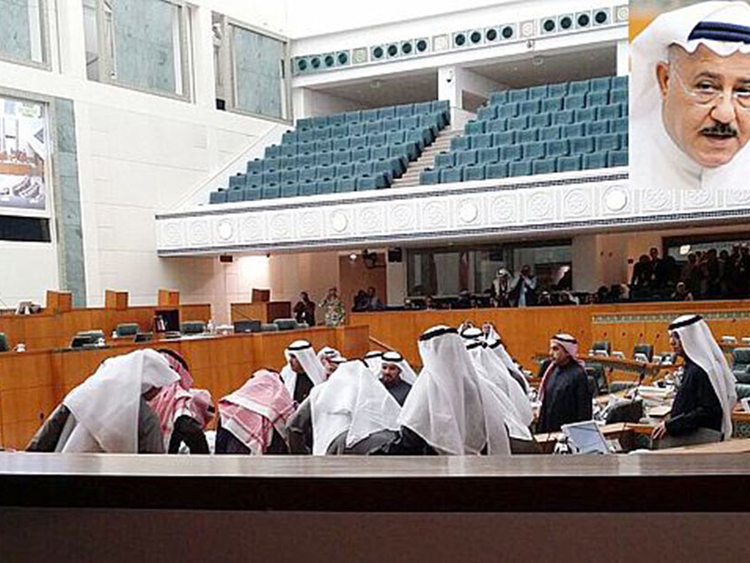 Manama: A Kuwaiti lawmaker collapsed and died during a regular parliamentary session on Tuesday. Parliament Speaker Marzouq Al Ghanim said that Nabil Al Fadhl died of an unspecified medical condition during a parliamentary session on Tuesday, according to Kuwait News Agency. Speaker Marzooq Al Ghanem said that Kuwait lost a man who was performing his patriotic duty as a representative of the nation and as a legislator. The government also expressed condolences to Kuwait over Al Fadl’s death. Al Fadhl was one of the most colourful MPs in parliament, always speaking his heart out and regularly courting controversy. A former Kuwait Airways pilot and columnist who wrote extensively about various political issues, he was outspoken against what he saw as regression and backwardness from Islamist parliament members. Kuwait News Agency said he was born in 1949. In January, he said that he would submit a motion to normalise relations with Israel. “I know the motion will not be passed by parliament, but I want to spite those who have become more royalist than the king,” Al Fadhl said. “Many Arab countries, such as Egypt and Jordan, have relations with Israel. The Palestinians themselves have relations with Israel. Are we better than these countries or are we more Arab or more Muslim than them? We have achieved only losses from boycotting Israel. We have gained nothing and we are losing access to good products,” he said. Kuwait, like most Arab countries, has no diplomatic relations with Israel and the Kuwaiti parliament is set to debate a motion to reinforce the 1964 law that boycotts Israel. Also in January, Al Fadhl, alongside other lawmakers, pushed for the cancellation of a lecture by an Egyptian Salafi scholar. Mohammad Yacoob had been reportedly invited by the organisers of “Hala February” festival to deliver a lecture. However, under pressure from the lawmakers who rejected his ideas as divisive and as a risk to Kuwait’s social unity, it was cancelled. Al Fadhl said that the government should take action against those who invited him to Kuwait and scheduled his lecture. “I wish to know whether those who are behind this invitation will face legal action for targeting the country’s national unity,” he said. In December, he challenged the constitutionality of an article in the Nationality Law that bans the naturalisation of non-Muslims, saying that the condition was a constitutional and legal stigma. He later provoked a storm of protests when he said he did not mind the legalisation of alcohol in the country, arguing that it was part of the local heritage. Fellow lawmakers condemned him for his claims amid reports that they would sue him. Kuwait’s parliament banned the sale of alcohol in 1964. Also in December, he called for lifting restrictions imposed one decade ago on organising concerts and musical shows in the country. “The restrictions that were imposed in 2004 to satisfy the demands of the religious lawmakers and avoid the quizzing of the then minister of information have failed,” Al Fadhl said. “Kuwait has suffered tremendously from the negative consequences of these restrictions and the major effects include the rise of extremism, forcing several people to go to other countries on holidays and the emergence of a sense of loss among young people who keep parading with their cars to impress girls,” he said. The information ministry should now step in and address the situation by lifting the restrictions that the government, under the pressure of the circumstances in 2004, was forced to accept, he said. “The conditions that obliged the government to accept the restrictions do not exist now, so let us put an end to this masquerade that turned Kuwait into a country with no joy. I call for a bold decision that brings joy and happiness back into Kuwait,” he said. Restrictions were imposed in 2004 after 31 of the parliament’s 50 lawmakers objected to a concert performed by singers from the Star Academy reality show.